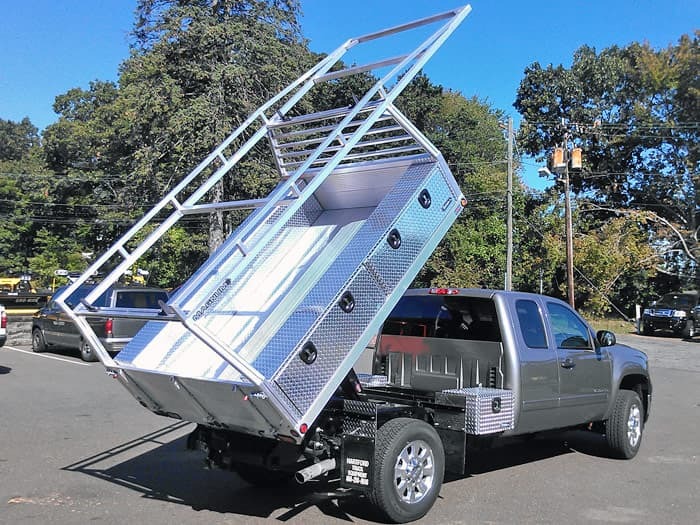 If you have a need for a dump body on your pickup truck you should seriously consider an all-aluminum dump body from Magnum Manufacturing. By using aluminum we maximize the performance of your pickup truck by keeping the weight to a minimum. Plus our aluminum dump bodies are built to outlast your pickup. Dump bodies can be built with our overhead racks and head racks built in along with plenty of storage compartments to hole tools and accessories for any type of job you need done. By making our beds and bodies out of aluminum we not only offer the advantage of lighter truck bodies we can also say that they will never rust. We also don’t like to brag but they make your pickup truck look mighty nice! Do you carry a lot of dirt? Do you haul gravel or other material that can wear out the finish on a dump body? If so the aluminum body from Magnum is your solution. Our designs have been tested and re-tested until we were satisfied with a product that we knew would stand up to the types of work trucks these bodies are going to be placed on. We understand that if our products are not satisfactory than there is no sense building them in the first place. Our dump body products are made to have the most functionality possible while giving your truck style and longevity. If you own your own business you don’t want people to see you driving around with a rusty old dump body, especially if it is only a few years old. Instead you could have a shiny aluminum body with diamond plate outer panels. Protect your investment as well as your reputation with an all-aluminum dump body from Magnum Manufacturing.